In this TV spot for New Balance, TALCO goes face to face with Canadian olympic tennis star Milos Raonic. 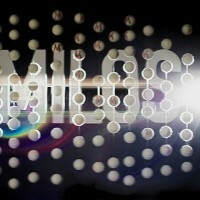 We teamed up with a New York based company hscusa.tv to bring Milos to life in full HD, high speed, glory. Filmed at frame rates upwards of 700 FPS using a Phantom HD camera we required special high frequency HMI ballasts that have only become available within the last few years. Paramount Production Support in Vancouver helped us obtain state of the art Power Gems 300hz capable electronic ballasts. This allowed us to use two 12k PAR and one 4k Par to shoot this high speed photography. We would not have been able to do this a few years ago using these types of luminaries. Click any of the following pictures to enlarge/slideshow. In the following picture you can see us setting up for the shoot with two 12k Par, an Ultra Bounce 12×12 frame, and some Power Gems ballasts. All HMI were using 300hz capable electronic ballasts and were flicker free at 700-1000 FPS high speeds for the Phantom camera. A few years ago HMI would have been out of the question for this type of photography. We would have had to use T12, 20k Tungsten Fresnels, or Maxi Brutes to get the amount of light we needed without flicker. For those who are not familiar with high speed photography, the photo frame is exposed so fast that it can detect the cooling down of a tungsten filament between cycles as it becomes energized on and off rapidly reacting to the sine-wave pattern of AC – alternating current (60 hz North America). Larger filaments – generally 5k and up — tend to be safer because they are so large they burn hot, so the cool down effect of the filament is not as perceivable. However, tungsten are large — we considered 20k Fresnel, T12’s, and Maxi Brutes — hot, and the light was too warm in color temperature for our commercial shoot. We wanted to be far away and unobtrusive with the lights. They needed to be cooler, and able to focus tighter beams. We considered Luminsys Softsun strobe lights by the makers of Lightning Strike. But they are an expensive specialty item and require special consideration to power. They also sometimes have issues of overheating we have found. Instead we choose a workhorse staple in the film industry: HMI PARS. HMI discharge lights operate differently then Tungsten. They use a transformer (ballast) which features a complex system of capacitors, coils, and circuits to build up high voltage electricity which arcs through a vacuum chamber of metal. The metal ignites into gas/vapour, then the voltage lowers and stabilizes to pulse through the vapour, causing it to emit light. In its most basic form — the heavy “boat anchor” magnetic ballast — the electricity passing through the vapour changes polarity 120 times per second at North American 60 hz frequency. With each polarity change the light momentarily strobes. This happens so fast that the human eye cannot detect it very well but the camera certainly can unless it is synchronized to a compatible shutter angle. Originally magnetic ballasts required cameras to be set to “hmi safe” speeds (frame rates which divide evenly into 120 (60/40/30/20fps) or the camera would catch an inconsistent amount of pulses per frame, creating a rolling strobe effect. Then electronic ballasts came out and offered Flicker Free, which was basically an electronic switching that chopped the sine-wave pattern into a tighter “square-wave” pattern making each individual pulse less discernible. This minimized the rolling strobe effect and allowed some irregular shutter rates, but the max speed possible to shoot at was still limited by the output frequency of the electronic drivers. HD Cameras have gotten faster as well. The technicalities of capturing, and then recording the millions of pixels involved in one thousand high definition pictures per second are astounding. The HMI technology has steadily kept up the pace. First electronic ballasts offered 100hz output cycles providing more pulses per second then at 60hz. Now Power Gems offers 300hz and Arri has 1000hz capabilities. The cameras can go upwards of 2500 fps theoretically pushing Arri’s 1000 hz to the test. Anyway, in our experience Power Gems lived up to their claim of flicker free up to 1000 fps using their 300hz output ballasts. These power gems ballasts are widely available in rental houses although some inventory may not have 300hz capability (although they can be sent back to Power Gems for an upgrade card to retrofit them if they don’t have the feature stock). They may not be as fast as Arri’s 1000 hz ballasts, but for us and up to 1000 fps they were adequate and most importantly, readily available. Here’s a little spin-off second portion of our shoot which was used for Biotherm Canada called “Ace Your Serve”. This video was used as a comic promotion it was supposed to feel like candid television. A true indie experience, last September we were in Calgary for 3 weeks working on a film with local cinematographer Aaron Bernakevitch. The experience re-equainted us with filmmaking outside of Vancouver, where the dream is still very much alive! In fact, local businesses were friendly and the city was inviting. 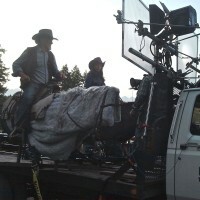 It appears that without a lot of big productions in town, everyone was just happy to see us filming there. 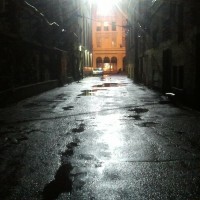 We didn’t have an experienced locations department or any of the typical production support we are accustomed to from our hometown of Vancouver (a hollywood spin-off with a large production infrastructure), despite this we were were able to use our experience to safely create big budget lighting in a town that rarely got to see it. Among our accomplishments: We flew a condor in front of the Bay at night in the heart of downtown Calgary. The production was able to get a water truck to make the streets shine for the shot, further enhancing the effect. We did a stunt shot to simulate an actress’s drug high by using a man-cage attached to a forklift on a downtown street. A steady-cam ran backward framing a medium shot of the actress as she stumbled forward. Camera and talent both step seamlessly into the man cage of the forklift, we safetied them discretely, and it raises up 20 feet in the air giving the illusion that the actress is walking forward, then floating up as the camera stays seamlessly on her and the sidewalk vanishes as the building perspective raises. http://talcolighting.com/contents/wp-content/uploads/video-gallery/Behind-the-Scenes/video.flv We also built another process trailer from the ground up, something we seem to do on all our out of town shows. This one we organized a 24′ trailer towed by our producers pickup truck. We loaded our 10k diesel generator and two HMI ballasts in the back of the truck. Then we hitched up the trailer and built a scaffold pipe safety railing around one side of the car and the camera area in front. We outrigged one of our 2.5k HMI par along the drivers side window of the car and mounted a 4k HMI Par in the foreground on the deck by the camera position. We also mounted a pee-wee dolly for the camera platform so they could get the slow camera boom up shot from the grill of the car to the windshield as the rig travelled down the street. This was a roofing safety video for WorkSafe BC. We filmed in the pouring rain. 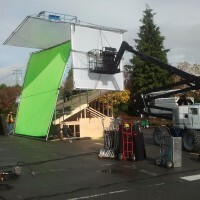 We needed to get a large rain cover safely in the air above the set which was built 8 feet off the ground to simulate a rooftop. We built a “fly swatter” by rigging a 20×20 clear to the basket of a gennie lift. We sent it up unmanned from the base and were still able to position it, making adjustments with ease using the versatile controls of the lift. We could pan and tilt the basket, extend the primary and secondary boom, and telescope the arm, all from the ground. It worked great. Here’s some photos. Our new Modern Studio Equipment “hostess tray” style side mount in action on a Dodge Viper Powered SRT-10 Ram. We’re in beautiful Kelowna, BC at the moment on our third feature with the ever popular Vancouver based independent cinematographer Norm Li. It stars up and coming english actor Luke Goss previously known as part of the brit pop duo Bros. It is directed by Justin Donnelly from TV The Troop. … yes we are way behind on our posts — ! Contact us if you’d like to rent our car mounts or find out more about flying Norm’s lighting balloon. TALCO returns from 3 weeks filming a movie in Edson, Alberta! The feature film, BELOW ZERO — starring Terminator 2’s Edward Furlong, horror legend Michael Berryman, and supporting actress Kristin Booth — takes place in a butcher shop where a captive writer (Furlong) gets twisted into dementia when confronted with a deadline he cannot face by his agent (Kristin). Blurring the lines between a depressing reality and a beautiful macabre, the writer’s angst manifests in a gruesome character of his own creation (Berryman) while the writer himself explores a sick fascination with the butcher’s son, a pecular little boy named Golem. [nggallery id=6] We filmed in a small highway town far from infrastructure which challenged us to improvise. We originally built extended hood rigs on our vintage picture trucks using scaffold pipe and sliding cheese plates, but the gravel roads proved to be too shaky with the old truck suspensions. We had no stabalizers so we ended up building our own process trailer from a flatdeck base, ground up. The night exteriors ended up being a simple task done in a minimalist way using cinematographer Norm Li’s 4k Airstar Helium Balloon Light. A photo of which from us even ended up on Norm Li’s website.